Pure DExpander V3 is carefully designed to de-expand the audio material by magnifying the space information and enhancing the low levels of the material by amplifying the signal below the threshold instead of making all audio under a certain threshold quieter. This results in a more compact and louder signal without giving the material a harsh and processed sound, instead keeping an organic character to the material. 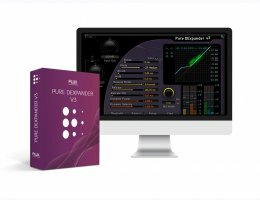 In addition to the more common dynamics processing controls (ratio, attack, release, etc), Pure DExpander v3 provide control over the essential dynamics profile it uses, all in order to offer the user full control over the processing even in the most demanding situations.